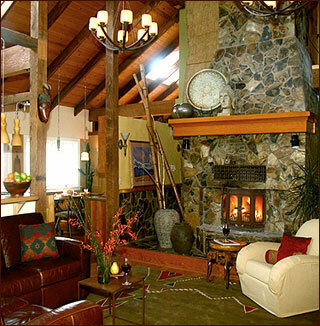 In this superb Sierra Foothills setting, just minutes from Placerville, the California Gold Discovery site, and local wineries, the rich natural colors of the accommodations are reflective of the lush gardens and surrounding natural beauty. 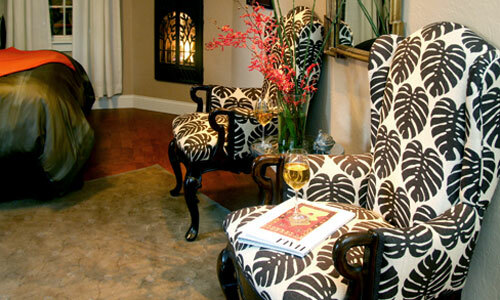 This luxury inn offers five exclusive private rooms, each with a unique style designed to soothe the senses and invigorate the spirit. 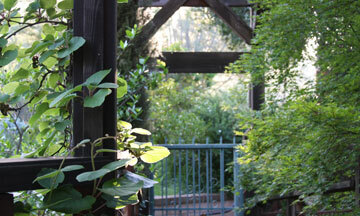 Wander the extensive grounds and experience the intimacy of the beautifully landscaped gardens. Join in the evening ritual of feeding the rainbow trout in the spring-fed pond. 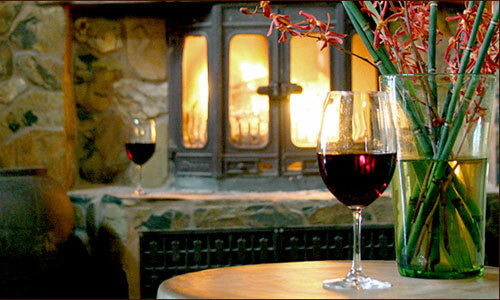 Feed your romantic spirit by soaking in your own private two person outdoor tub or sip wonderful local wine in front of your own fireplace. A full breakfast of whole fresh foods comprised of two entrees, fresh fruit, cereal, tea, coffee, fresh home baked goods and tailored to any individual needs is served daily. Amenities: all rooms include full bathroom, high speed wireless internet and ethernet, and free unlimited domestic phone calls. The Stone Pine is a garden terrace level room with a queen-size bed, private patio entrance, gas fireplace, and private bathoom. Pets allowed with pre-approval. $149-249 per night plus tax. The Cypress is a garden terrace level room with a queen-size bed, private patio entrance, gas fireplace, and private bathoom. This room shares a wet bar/mini kitchen with the Cottonwood room: microwave, sink and refrigerator. 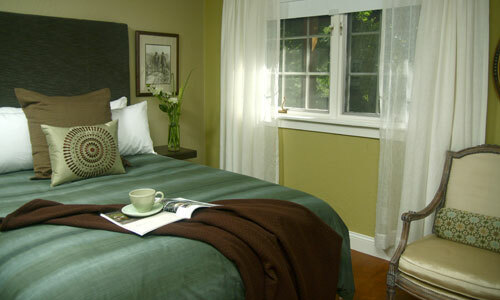 $139-239 per night plus tax. 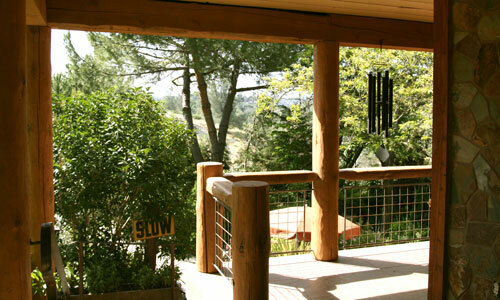 The Cottonwood is a garden terrace level room with a king-size bed (which can be converted into two twin beds), private patio entrance, gas fireplace, and private bathoom. This room shares a wet bar/mini kitchen with the Cottonwood room: microwave, sink and refrigerator. It is our largest room. Pets allowed with pre-approval. 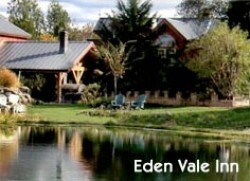 $179-279 per night plus tax. The Juniper is a pavilion terrace level room with a queen-size bed, private patio entrance, gas fireplace, and private bathoom. This room has a Japanese spa soaking tub for two out on the private patio garden area. No pets. 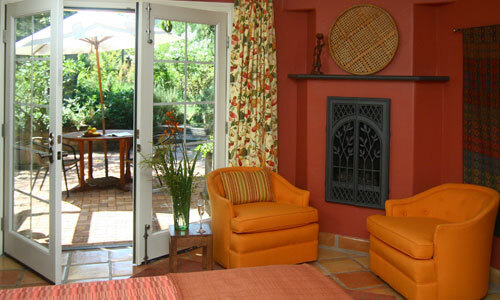 This room connects with the Live Oak room through a private hallway allowing them to be used together as a two room suite. $199-299 per night plus tax. The Live Oak is a pavilion terrace level room with a queen-size bed, private patio entrance, gas fireplace, and private bathoom. 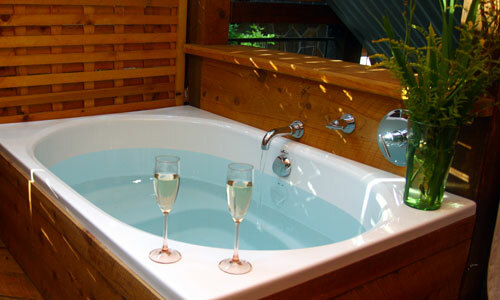 This room has a Japanese spa soaking tub for two out on the private patio garden area. No pets. This room connects with the Juniper room through a private hallway allowing them to be used together as a two room suite. $199-299 per night plus tax.